In discussing joy through a series of paintings in The Art of Lent, Sister Wendy Beckett begins on an apophatic note. 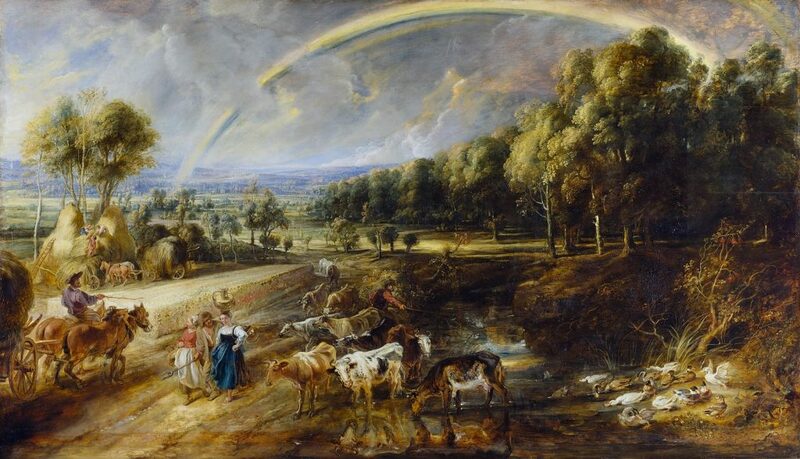 The first artwork revealed to the reader, Peter Paul Rubens’s Rainbow Landscape, is one of euphoric natural beauty, a rural idyll spread out with the manifested signs of countryside industry: a farmer driving a horse-drawn cart past hearty, cheerful women, working together amongst ‘benign cows’, as Sister Wendy quips. Behind, a polychromatic sky bears forth the full arc of a rainbow. The hues are brighter, and the textures more striking, than any earthly scene could replicate; undoubtedly, the image is a crafted and cultured vision meant to affect a sentiment of happiness and peace. And yet, as Sister Wendy says, the scene, ‘precious though it is, is not joy’. It is too vast, too comprehensive to be an able conveyer of a reality which Sister Wendy suggests abides by its own inner reason. As she says, ‘Rubens chooses: he emphasizes the good things. Joy is independent of choosing: it overwhelms and suffuses us’. Throughout her week-long discussion of this week in Lent, Sister Wendy moves through five paintings from this overly-defined landscape of joyfulness in an ever-shrinking trajectory. Each image and corresponding reflection pare away the reader’s preconceived notion of joy until it has been honed down into an inconceivable other, beyond knowledge itself. In addition to the Rubens, two other paintings curated by Sister Wendy will be explored in the remainder of this reflection, to further enter into Sister Wendy’s mysterious, ascetic understanding of joy. The next painting considered retains the hyper-idealism of colour and light found in Rubens, and yet delimits it, zooming into the frame so that the viewer only receives a small dose. Pierre-Auguste Renoir’s Children on the Seashore reveals a moment of tranquil settledness. Each of the children depicted are in a satisfied repose; each looks to one of the others, as if receiving in the eyes of another something which arrests his or her movement and slows time itself. Indeed, Sister Wendy suggests that joy proceeds from ‘the timelessness of their experience’. The viewer might think that if the image were set into motion momentarily, very little would actually occur in the elapsed time. Even the stylisation of the painting affirms this, using its impressionistic strokes to blend away the certainty of narrative. 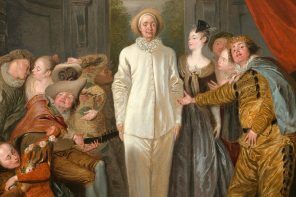 It is a sort of epiphanic stasis, within which is opened up a generous potential for encountering something more than the curated happiness given in the Rubens. The Renoir is a truth told ‘slant’, in the words of Emily Dickinson. ‘Too bright for our infirm Delight / The Truth’s superb surprise’. It is as if the blurred lines of comprehension reveal, in their abstraction, more of joy than a direct manifestation of the scene ever could. For Sister Wendy, White Clematis achieves this sense in a meaningful way. What would otherwise be a tranquil still life of white flowers is pressed inward, held a little too close. The viewer is drawn into the frame, into, as she remarks, ‘the blazing whiteness, with the shimmer of purest lemon yellow at the heart’, and held too close at hand to the luminous, such that the image provokes the desire to step outward. And yet, as Sister Wendy relates, ‘we feel that no canvas, however large, can capture what is seen’. In the midst of this numinous encounter is an ascetic realisation that the apprehension of this ‘vision’ can only be had in the admission of the incapacity to grasp its immediacy: ‘we recognize it, not for what it is, but for what it makes us recall’. And yet this could not possibly be recollection in a retrospective sense, as if drawn out of memory or experience, which would, in itself, be an experiential sort of knowing; rather, it must be a recollection of something innate, foundational, boundless, ‘Neither movement from or towards, / Neither ascent nor decline’, as Eliot remarks. It is not so much that joy is obscured within the tall grass of the past nor hidden within the thick forest of the future, but rather is in the unseen atmosphere of the present which enlivens them both, and all who stand within time, gracing them with the palpable breath of its wind, and yet always stretching beyond anything conceived within the limits of the human mind. Sister Wendy leaves the viewer in the margins just beyond the frame of each painting: pressing inward, ever closer to the canvas, into a participation so near at hand that no space remains for mere rational comprehension. And yet the closer the viewer comes to the texture and the colour and the light, the greater the distance between each grows. Knowing this, even as she urges the viewer forward, Sister Wendy gently turns the viewer’s face away, until that approach is ever caught in a half-turned hesitance. Ultimately, for Sister Wendy, joy is not a moral exemplar to positively understand and express, nor even a state of being to achieve and experience, but rather a living reality present in the here-and-now; the participation in that reality is made manifest through a comportment before that reality, a chosen stance of willing denial. It is not one of active tensing of the muscles of virtue or positive disposition, of straining-toward, but rather one of release, of relaxation, of practiced inadequacy. It is a conscious circumspection that never looks joy directly in the face, else it be lost. Within this paradoxical peripheral vision, one comes into the borderlands between the broken world and the illuminative presence of grace. It is precisely within that liminal space that joy resides. 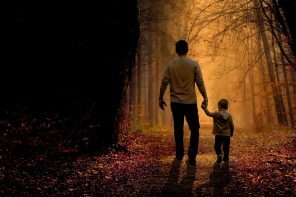 In the movement of kenosis, contact with joy is made possible, for in that movement, one also begins to receive a likeness, the likeness of the person in whose image joy itself is shaped. It is not in facing the wind, but rather in turning away from it, that one gains the blessing of its motion. The still point of joy works itself upon those who turn away from the grasp of it, and live instead in the current of its presence. Peter Paul Rubens, Rainbow Landscape: https://commons.wikimedia.org/wiki/File:Peter_Paul_Rubens_-_Landscape_with_a_Rainbow_-_WGA20411.jpg. 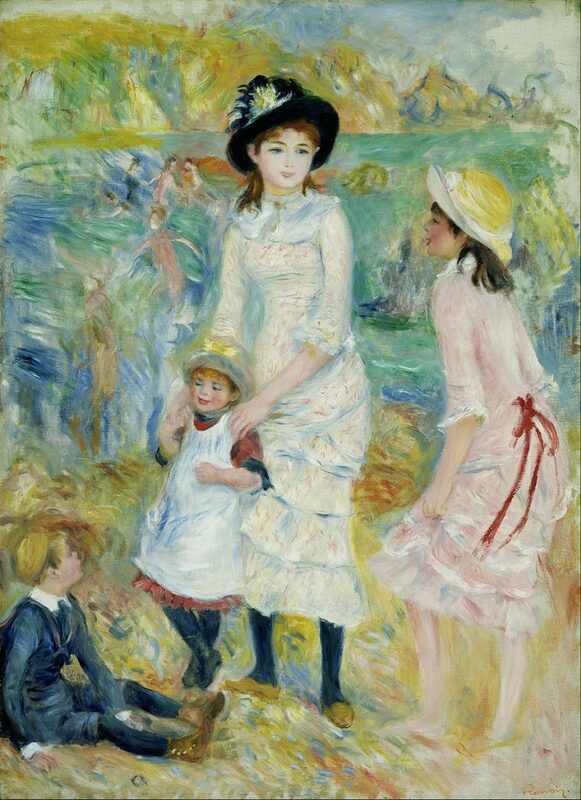 Pierre-Auguste Renoir, Children on the Seashore: https://commons.wikimedia.org/wiki/File:Pierre-Auguste_Renoir_-_Children_on_the_Seashore,_Guernsey_-_Google_Art_Project.jpg. 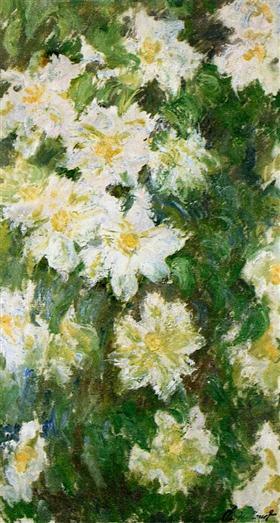 Claude Monet, White Clematis: https://commons.wikimedia.org/wiki/File:Monet_-_white-clematis-1887.jpg. Sister Wendy Beckett, The Art of Lent: A Painting a Day from Ash Wednesday to Easter (London: SPCK Publishing, 2017), 54. Emily Dickinson, ‘Tell all the truth but tell it slant—’, in Complete Poems of Emily Dickinson, ed. Thomas H. Johnson (Oxford: Alden Press, 1975), 506. Beckett,The Art of Lent, 64. T. S. Eliot, ‘Burnt Norton’, in The Poems of T. S. Eliot, Volume 1: Collected and Uncollected Poems, eds. Christopher Ricks and Jim McCue (London: Faber & Faber, 2015), 181. Harold H. Watts, ‘T. S. Eliot and the Still Point’, Chicago Review, Vol. 1, No. 2 (Spring 1946), 56. Joel Clarkson is a composer for film, concert, and sacred music, an audiobook narrator, and an author of four nonfiction books. He is currently pursuing a doctorate at the University of St Andrews in Scotland, where he studies the interplay between theology and sacred music. Should beauty have a price tag (and if so, how much)?